The first period of the Roman Empire is called the Roman Principate. During this period, emperors tried to give the illusion of a functioning republic when in fact they had full powers. Rome remained in theory a republic but emperors gradually destroyed all republican values. The Roman Principate was a happy period though. It was actually happier than the Roman Republic, more stable and safer, and... more glorious. Following the Battle of Actium and the death of Mark Antony in Egypt, Octavius had full powers in Rome. In 27 B.C. he took the name of Augustus and established what would be later called the Julio-Claudian dynasty. This dynasty had 5 emperors: Augustus, Tiberius, Caligula, Claudius and Nero. 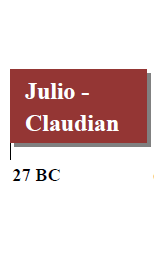 It was called Julio-Claudian because Augustus came from the gens Julia which was one of the oldest patrician families in Rome (Julius Caesar was his grand father) and because Tiberius came from the gens Claudia which also was an old patrician family and one of the most prominent. Very quickly Augustus acquired all powers and the title of princeps. He was consul, censor, tribune, aedile (aediles were in charge of the maintenance of public buildings, public order and the regulation of public festivals) and even princeps senatus (who was the first member by precedence of the Roman Senate). He greatly diminished the powers of the Senate especially of the senators (of the old patrician families) and gave more powers to the equestrians. He also reformed the military giving him total control over the army and created the Praetorian Guard. Despite this, the Roman Principate period under Augustus' rule was more peaceful than the Second Triumvirate and the economy was thriving. Augustus brought what we call the Pax Augusta. Because a lot of people were becoming richer, most of the upper class in Rome supported the emperor. Augustus was also conquering new lands: Cantabria Aquitania, Raetia, Dalmatia, Illyricum and Pannonia. Some of his generals became very popular including Marcus Vipsanius Agrippa, Nero Claudius Drusus and Germanicus. 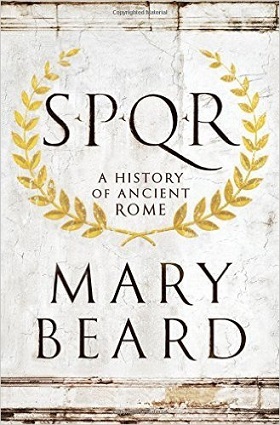 Augustus' reign was also rich in literature with authors that are known to this day including poets such Vergil, Ovid and Horace and historians such as Livy. Furthermore, August changed the Roman calendar and introduced the month of August. Augustus had a wife called Livia Drusilla. Livia had a son from a previous marriage called Tiberius. She pressured Augustus to have her son named as his heir. The Senate agreed and Tiberius received all the honors and held the title of princeps. Tiberius had no interest in politics though. He retired to the island of Capri as soon as 26 AD (after getting the approval of the Senate). The city of Rome was now under the control of Sejanus and later Macro (both praetorian prefects) from 26 to 31 A.D. and from 31 A.D. to 37 A.D. respectively. Many Romans considered Tiberius as an evil emperor. They suspected him of killing his own relatives, General Germanicus (who, as we previously pointed out, was one of the very popular generals) and even his own son Drusus Julius Caesar! Tiberius died of old age in 37 AD even though historian Tacitus gives us another account: Romans first rejoiced when news spread of Tiberius' death (from natural causes) but they became quiet upon hearing that he had recovered from his illness. Caligula and Macro then choked him to death and Romans rejoiced again. Caligula was Tiberius' grand nephew. There was no male in Tiberius' bloodline old enough to rule the Empire, therefore Caligula was chosen. Even today the name Caligula brings to mind the image of a mad and cruel emperor. But Caligula was actually quite popular at the beginning of his reign. It is only two years into his reign that he became mad. Historians of the time state that he organized orgies, had sexual relationships with his sisters, killed men for fun and even named a horse consul. Caligula didn't last long though. 4 years into his reign he was killed by the Praetorian Guard. The Praetorian Guard proclaimed Claudius as the new emperor with the full approval of the Senate. Claudius was Tiberius' nephew. Nobody could have ever imagined that he would one day become emperor. He didn't have the charisma, he was limping and was even slightly deaf. But he was the only man belonging to the Claudian family alive following Caligula's assassination. Claudius turned out to be a decent emperor in the Roman Principate. His reign lasted 13 years. He wasn't as cruel as his predecessors. He managed the empire efficiently. He built many new roads, canals and aqueducts. He also conquered Thrace, Lycia and Judaea, and even started the conquest of Britain. Claudius's reign ended when his wife Agrippina the younger poisoned him in 54 AD. Agrippina had a son from a previous marriage called Nero whom she wanted to become emperor and Nero was proclaimed emperor upon Claudius' death. Nero is remembered to this day as a cruel and brutal emperor of the Roman Principate. Many Romans suspected him of being behind the Great Fire of Rome during the Roman Principate(according to legend, Nero was fiddling as Rome was burning). He is also known for executing many Christians. Nero faced many revolts that he squashed including the Jewish revolt also known as the First Jewish-Roman War. Eventually many in the Roman aristocracy turned against him including the entire Senate and Nero committed suicide. Nero's death in 68 A.D. was followed by a brief civil war and what we call the Year of the Four Emperors during the Roman Principate. The year between 68 and 69 A.D. saw four emperors: Galba, then Otho, then Vitellius, and then Vespasian. In July 69 A.D. Vespasian was the first emperor of the Flavian Dynasty in the Roman Principate. Vespasian was a general under Claudius and Nero and during the First Jewish-Roman war. Vespasian was overall a good emperor, known for rebuilding many buildings in Rome following the Great Fire of Rome, and building many new ones including the Flavian Amphitheater known today as the Colosseum which was built with the wealth acquired during the First Jewish-Roman War! 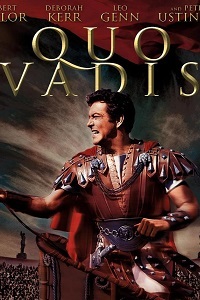 Titus was Vespasian's son and he had fought with his father during the First Jewish-Roman War. His reign was pretty short as he died from an illness (a severe fever) in 81 A.D.. Titus completed the construction of the Colosseum and organized games that lasted for one hundred days. These games actually celebrated the victory over the Jews and re-enacted battles, including naval battles inside the giant Colosseum. Gladiators fought to death and there were also impressive chariot races. Titus built many roads throughout the empire and fortifications in what is today Germany and Northern England. Dominitian was a totalitarian emperor during the Roman Principate who wanted to become the new Augustus. He wanted to establish the cult of himself, by comparing him to the Gods. He wanted to be called Dominus et Deus which means Master and God in latin. The Roman aristocracy didn't like him and he eventually was murdered by a conspiracy. The Nerva-Antonine dynasty was a good period for Rome during the Roman Principate. It was a stable period with no civil wars and no military defeats abroad. During this period, the Roman Empire reached its apex in terms of territory and its economy was thriving. The provinces in the Empire were more united. Emperors were selected based on their qualities and not their bloodline which is remarkable for that time. Also the constitution was respected and reverred and the Senate had more authority. Nerva was selected and appointed by the Senate. Nerva was of noble ancestry. He had previously been an advisor during Nero's reign and the Flavian dynasty. 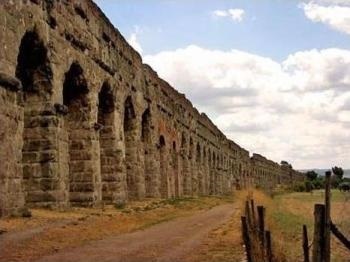 Nerva restored many of the freedoms that were supressed by Dominitian and Rome's economy was thriving under his rule. Nerva had named general Trajan as his heir. Trajan was a popular general in the Roman Principate. He became the first emperor of non-Italian descent. His family was from Hispania and was not patrician. Romans were very enthusiastic about Trajan in part because of his victories as a general. Trajan turned out to be a good emperor. He followed on Nerva's policy by reinstoring many of the freedoms lost under Domitian. Many people were freed, private property that had been confiscated during Domitian's reign was returned. 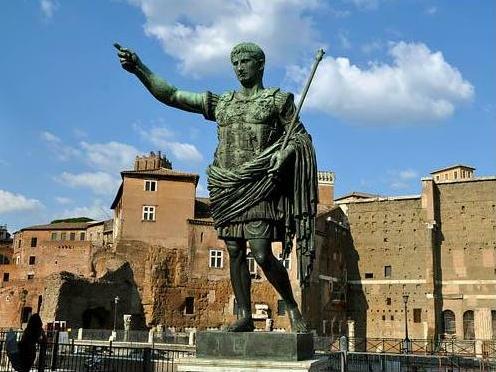 Trajan is also remembered for all the construction works under his reign, for example: the Trajan Market, the Trajan Forum and Trajan's column, noting that all these buildings dating from the Roman Principate can be seen today. He also built a large bridge over the Danube in Dacia. Trajan managed to conquer Dacia, a kingdom which had humiliated Domitian in the past. There were two Dacian wars: in the First Dacian War (101-102 AD) Dacia became a client state; in the Second Dacian War (105-106 AD) the Dacian army was completely destroyed and Dacia became part of the Roman Empire. Trajan also integrated another client state to the Empire: the state of Nabatea (located in today's southern Syria and northern Jordan). He also conquered Parthia (located in today's north-eastern Iran). Trajan went to war with Parthia over Armenia. Rome and Parthia shared control of Armenia. Parthia appointed a king that Rome did not like and as a result Trajan declared war. In 113, Roman troops entered Armenia and removed the king. In 115, Trajan entered Mesopotamia and conquered the cities of Nisibis ad Batnae. In 116, he conquered Seleucia and then Ctesiphon which was the capital of Parthia. In 117, Trajan died of an illness. Trajan named Hadrian as his heir. One of the first initiatives that Hadrian took was to remove the Roman troops from Parthia and Mesopotamia and therefore loose these conquests. The Roman economy continued to thrive under Hadrian during the Roman Principate. But Hadrian did not conquer new lands. He was a rather peaceful emperor and a humanitarian. He is known for his defensive strategies including Hadrian's Wall in northern England. He would travel to every province in the Empire to check on the military and its defenses. He also introduced laws against torture which is quite remarkable for his day. Hadrian loved Greek culture. The Hadrian's Arch in Athens can still be admired today. He built libraries, theaters and a lot of infrastructure including many public baths and aqueducts. Antonius continued Hadrian's policies. He maintained his humanitarian laws and promoted culture and knowledge. For example, he built theaters, set up financial rewards for teachers of philosophy. He also expanded the empire in England by conquering southern Scotland and building the Antonine Wall. Marcus Aurelius was known as the Philosopher and even wrote a philosophy book called Meditations. He ruled the Empire during this period of the Roman Principate with a co-Emperor called Lucius Verus. He fought the Marcomannic wars against the Parthian Empire. During his reign, the Empire was affected by the Antonine Plague a pandemic which killed close to 5 million people. Commodus was the son of Marcus Aurelius thereby breaking with the tradition of having a new emperor chosen based on his qualities. All the previous emperors of the Nerva-Antonine dynasty were known as the Five Good Emperors. However, Commodus was not one of them. He was very different from his predecessors. For example, he executed many Roman citizens, he participated in gladiatorial combats. He was also a decadent in his personal life. Commodus was eventually killed by a conspiracy organized by Quintus Aemilius Laetus and his wife. The next year was a year of turmoil with Roman generals fighting for power. Eventually after many battles (including one in Gaul) General Septimius Severus became the new emperor. Severus is not remembered as good emperor either. He actually wanted to restore a totalitarian state and he admired Marius and Sulla (both also known for their cruelty). In a speech in the Senate, he praised Sulla which had many senators worried. Septimius Severus had the support of the legions. But he also paid the legions comfortably for this support. 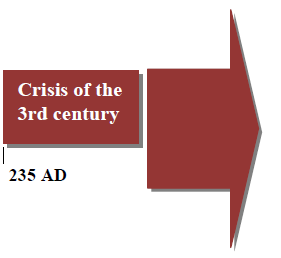 Eventually military expenditures became very high and a financial crisis emerged at the beginning of the 3rd century. Severus was known for his fierceness and brutality on the battlefield. When Parthia entered Roman territory, Severus attacked and looted many Parthian cities including Babylon, Seleucia, Nisibis and the Parthian capital Ctesiphon. Many people were captured and executed. However the invasion of Parthia didn't end well. Many of his legions starved to death and eventually Severus had to withdraw. Severus also intended to complete the conquest of Britain. He went to war with the Caledonians. However his army suffered a lot of casualties: the terrain was difficult and the barbarians there used the equivalent of guerilla warfare. The ferocious Severus fought himself on the battlefield but was struck down by illness and died in 211 AD. Severus had two sons: Caracalla and Geta. Both became emperors upon his death but Caracalla quickly removed his brother. 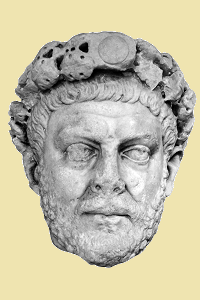 Caracalla resembled his father: he was a man of war and he was cruel. He executed many people including people close to him like his tutor or a close friend of his father. However he had the respect of the legions. The best example of Caracalla's cruelty is the killing of most inhabitants of Alexandria. Caracalla knew that most people in Alexandria didn't like him. So he travelled to Alexandria. He had a banquet and invited Alexandria's high society. In the middle of the banquet his soldiers killed all the guests. Then Caracalla marched in Alexandria with his army and killed almost the entire city's population. Caracalla is known for the Edict of Caracalla which gave Roman citizenship to all free men living in the Empire. He is also known for the baths of Caracalla in Rome which can still be seen today. Caracalla was killed by one of his soldiers during a campaign in Parthia in 217 A.D.. Actually the soldier just carried out an order from the Praetorian prefect Macrinus. Macrinus was in power for less than one year. Elagabalus who was a member of the Severi and fought against Macrinus with the support of the legions. Elagabalus was however incompetent as a ruler. He is also remembered for his extravagant lifestyle. Alexander Severus was Elagabalus' cousin. Alexander had to face many conflicts during his reign. He had to fight a war with Persia and then another with invaders from Germania in Gaul. Alexander suffered great losses and many soldiers were displeased with him. Eventually he was killed by his very own soldiers during his campaign in Germania. A period of political chaos ensued the death of Alexander Severus. There were in total 26 emperors in the ensuing 49 years of the last period of the Roman Principate. Most of these emperors became emperors through war and most did not belong to old noble Roman families. A combination of very negative factors made things even worse towards the end of the Roman Principate: civil wars breaking out throughout the Empire, foreign invasions, a deep economic depression combined with hyperinflation and even pandemics spreading like fire (including the Plague of Cyprian in 250 AD). Actually the emperors were not concerned about the economy or defending the borders of the Empire but only about staying in power. Roman people gradually started loosing faith in their old religions and values and increasing turned to Christianity and the cult of Mithra. In 260 AD the provinces of Egypt, Palaestina, Syria and Asia Minor separated from the Empire and formed the Palmyrene Empire ruled by Queen Zenobia from Palmyra in Syria. In that very same year, Britain and Gaul broke out too and formed the Gallic Empire. Rome lost its importance in the Empire. It is only during the reign of Aurelian (reign: 271 - 275 AD) that the Gallic and Palmyrene Empire were reconquered. The crisis totally ended during the reign of Diocletian at the end of the Roman Principate.